Wireless speeds up to 10 times faster than today’s 3G from any other national wireless carrier (view larger). Eight MP camera with video and flash (view larger). 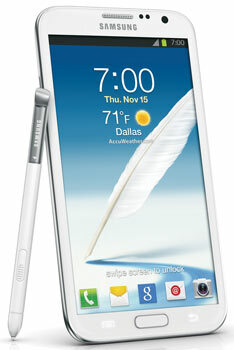 Samsung Galaxy Note II brings a whole new category of smartphones to Sprint. This high-performance device boasts many rich features and is indispensable when it comes to entertainment and productivity thanks to an enhanced S Pen hover experience, intuitive software, and elegant hardware features. Touch, hover, scribble, and speak—the Note II offers multiple tactile ways to interact. Capture and create with the innovative S Pen and preloaded apps like S Memo and S Note. Enjoy multitasking, intuitive interactions, customizable home screens, and more on the latest Google OS Android 4.1, Jelly Bean and the Samsung TouchWiz platform. With the latest HD Super AMOLED Plus technology powering the Note II’s 5.5-inch 720P display, images are bigger, clearer, and brighter than ever allowing you to view color-rich movies, photos, presentations, and gaming. With Note II performance and power are automatic, thanks to Samsung’s Exynos 1.6 Ghz quad-core processor, a long-lasting battery, and blazing fast 4G LTE network speeds. Run your office from anywhere, keep your business data secure and remain in compliance with IT policies with Note II, a Samsung Approved for Enterprise (SAFE) device that supports Mobile Device Management (MDM), on-device encryption (ODE), corporate email/calendar/contacts, and Virtual Private Networks (VPN). From multitasking features to IT security to tools for efficiently sharing ideas, Note II is built for business. A clear, crisp display paired with a comfortable and secure one-handed grip mean clarity and portability that goes where you go. Enjoy a more PC-like experience with the S Pen hover capability, which allows you to interact with the screen without touching it directly. Hover to find contextual information, preview links, and magnify websites. 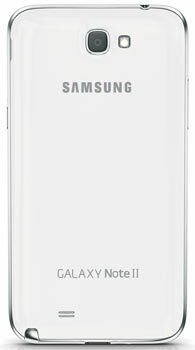 The high-performance Samsung Galaxy Note II, featuring a high-capacity battery and 4G LTE network capability, gives you the power to blaze through any task with confidence. Experience quick response and smooth playback thanks to the powerful performance of the Samsung Exynos quad-core processor. Capture and share your ideas in even more creative ways with the Premium Suite: Create detailed notebooks with S Note tools for recognizing shapes, solving math formulas, and completing text searches. Open, view, and edit Microsoft Office and Google documents on the go with Polaris Office. A refined and more accurate S Pen makes the Galaxy Note II easier and more intuitive to use. The Hover feature delivers more functionality with fewer clicks, making you more productive. The pen is now eight millimeters longer and one millimeter thicker, making it more comfortable to use. The device recognizes pen proximity to the screen (before touching the screen) and creates interaction opportunities for new behaviors, information and user experiences. When you remove the S Pen from its slot, a pop-up with S Pen related apps appears on the display. Apps include S Pen, S Memo, Zen Brush, and third party apps using S Pen SDK. The Galaxy Note II comes fully loaded with features. Access all your content anytime from anywhere with AllShare Play. Get all the Sprint services with Sprint ID, TV, Radio, MusicPlus and more. Keep up to date with all your favorite sports teams, stream movies, shop online and listen to tunes all with your phone. The Galaxy Note II also comes with Google Play, which gives you access to thousands of apps, and the Samsung Media Hub. The Galaxy Note II measures 5.9 x 3.2 x .4 inches and weighs 6.3 ounces. Bluetooth connectivity (version 4.0) backward compatible with older Bluetooth-enabled peripherals and includes stereo audio streaming.